I only used one of your photos because the other, while darker, did not shed any additional information on this specimen. 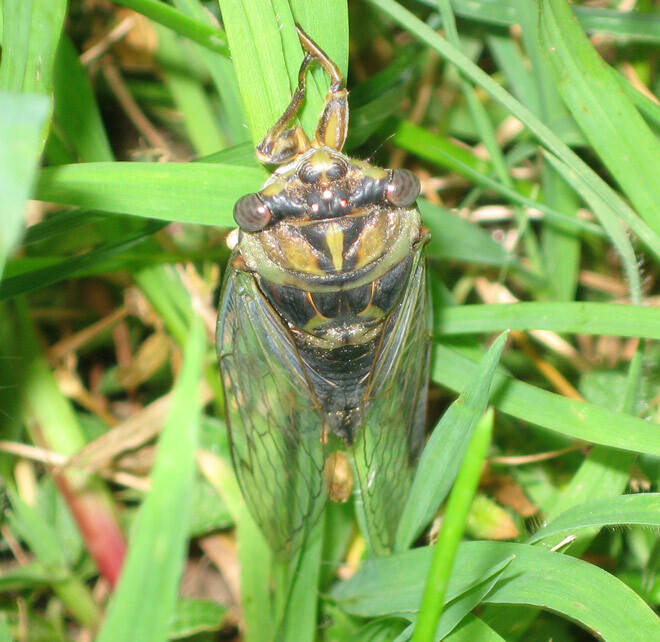 Based on the amount of the cicada I see and what I have noted in terms of species in your area, the most-likely identification would be Tibicen canicularis, the Northern Dog-Day cicada. It is one of our two most common Tibicen species here in the Northeast. Based on the lack of timbal covers at the base of the abdomen and the overall shape of it, I would put the gender at female. Thanks for sharing your report and providing useful information for our distribution database. Maybe a T. robinsonianus? The large green spot on the nose (I call it, "the Jimmy Durante proboscis"), the thin, black line along top that medially bisects the pronatal collar, along with the measurements given for the body length and width all seem to jive with the T. robinsonianus cicadas I find here in Missouri. Anyway, just my thoughts when I saw the photo. P.S. - That is to say, if the "length" measurement was body length and not head to folded wingtips length. It is doubtful that T. robinsonianus is here in New England. Not a single species has been reported here and after many years of documenting species in New England, I have never found one. In addition, the shade of green on the pronotum of this specimen is more tawny than the true rich greens found in T. robinsonianus. You know, I really feel for you and respect what you do; It's really friggin' hard to narrow down and accurately pinpoint a cicada species when all you have is one semi-clear head shot photo and are given a measurement of ".5 to .75 inches!" That's a "fudge factor" of over 6 mm! In the insect world, that's pretty darn significant.